17-inch DELL Computer Monitor recyling! 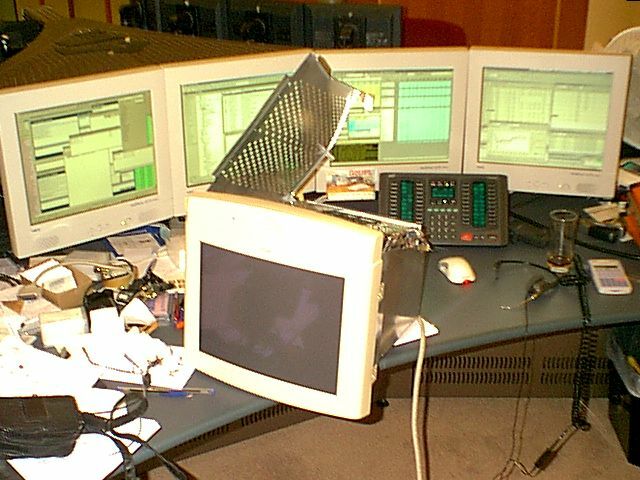 Don't throw away your old computer monitor! Inside there are numerous parts to restock your junk box. Scroll down to see what useful components I found in a 17-inch DELL multisync monitor, and photographs of the dismantling process. 2) make sure the unit has been switched off for some time to allow the internal high voltage capacitors to discharge. 3) Of course, watch out for sharp metal etc. 4) Recycling old electronics is ADDICTIVE! "John K" who emailed me with further warnings about dismantling monitors and televisions. 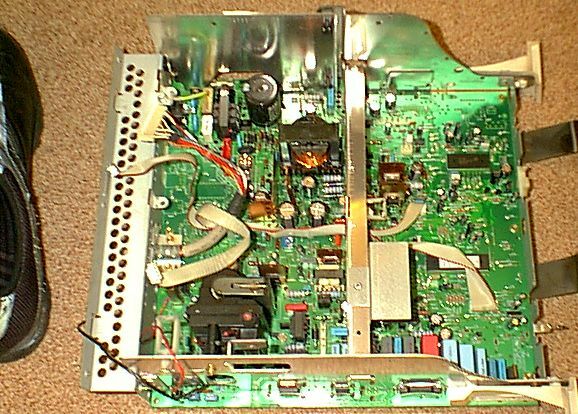 CRT's can store a high voltage charge, due to their behaviour as a capacitor (metalised coating inside and outside the glass). 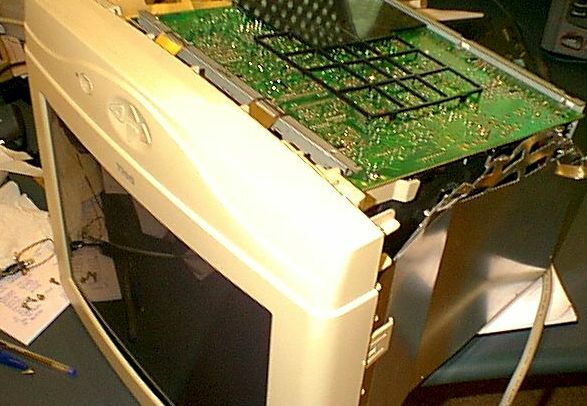 The danger is the EHT connection which you can normally find by looking for a thick wire going to a rubbery pad on the body of the CRT. Unfortunately, even if the "capacitor" is shorted out, within minutes a charge can rebuild by itself, via a process called "dielectric hysteresis", or "dielectric soak". The electric shock one might receive would be unpleasant but would likely do less damage than the probability of then dropping the CRT, which may then implode on impact causing flying glass injuries etc. John says: "many servicemen prefer to break the exhaust pip on the tube to let the air in. Said to be safer than risking the chance of an implosion". Personally I have dismantled many TV's and monitors in my life and never suffered shock or explosion. 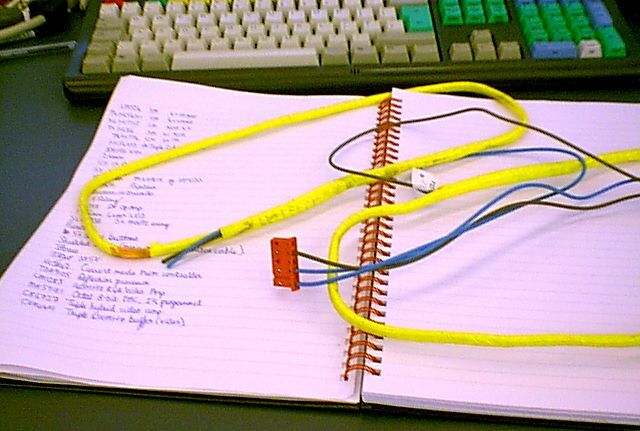 I suppose I generally cut the thick cable, extract the CRT then leave it alone, so haven't touched the wires. Still, this warning is good advice, definitely something to be aware of. More information on the dielectric hysteresis affect can be found at: http://www.siteswithstyle.com/VoltSecond/ and http://www.faradnet.com/glossary/d_gloss.htm#da . I will keep the PCB's and other parts in my junk box, and unsolder components as and when I find the need for them. NOTE ALSO: Barry Smith writes: "Another part of some monitors, and most TVs, is that squarish cone of metal covering the back of the CRT. I think its a mu-metal magnetic shield. Might be worth saving. At least, that's what I tell myself." Click the images for larger version of the photographs. Centre: Inside the monitor case, was a secondary box made of thin sheet metal: for RF screening purposes. Right: The driver PCB came off first. It has a socket which was plugged directly to the end of the Cathode Ray Tube. Left: Next I removed the deflection coils. These are supposed to create a magnetic field which directs the electron beam across the face of the screen. I have seen these coil yolks before in televisions, consisting of just two coils (horizontal and vertical deflection). Not here! This one has two main coils, but all manner of auxilliary coils mounted at various angles. 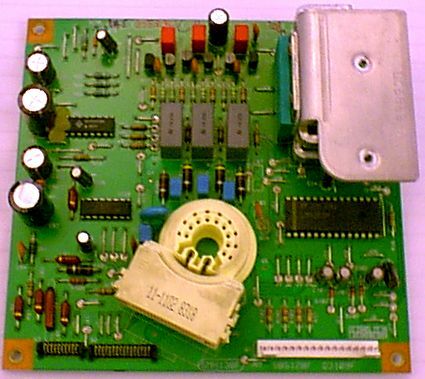 Centre: The main PCB is large and loaded with useful components. That's my shoe on the left of the picture. 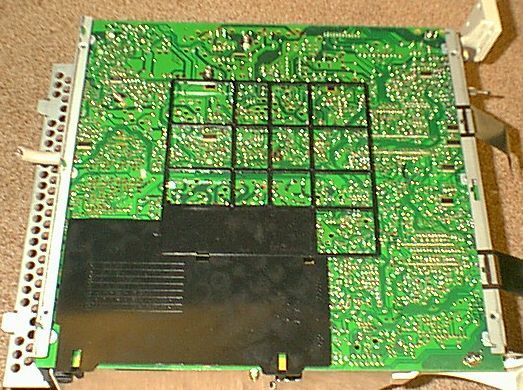 Right: The reverse side of the PCB. The removable plastic shield covers the high voltage areas. This side of the board is covered in surface mount components, including several useful IC's. Left: This small board fits in the front panel of the monitor, for user adjustment. It contains 5 buttons and one 5mm green LED. 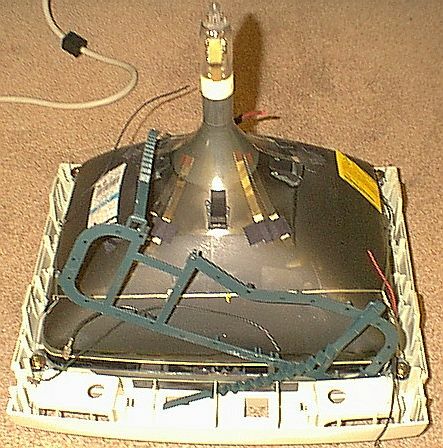 Centre: At the top and bottom of the cathode ray tube, just inside the front panel, were mounted these two large loops! 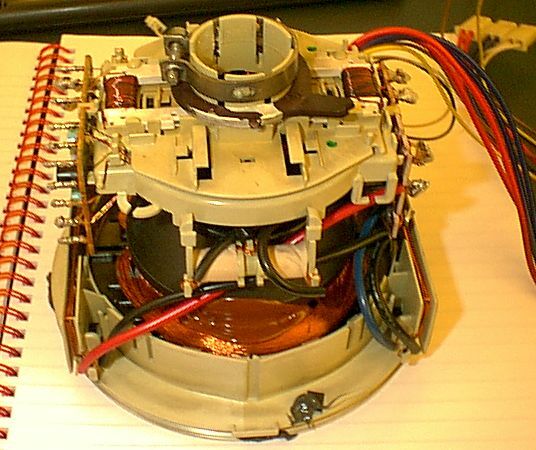 Thanks to Ray Redbourne for emailing me some further information: these are "degaussing coils", and are energised briefly at switch-in in order to remove any residual magnetism in the CRT. 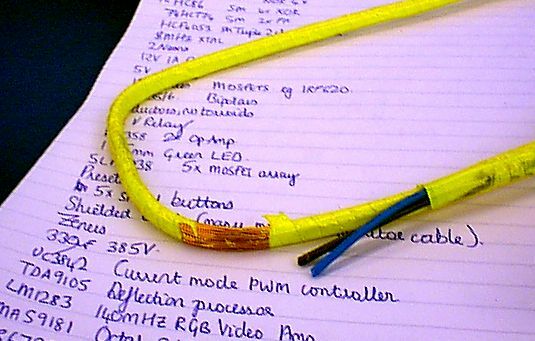 Right: Peeling away the plastic tape it became clear that they are coiled enamalled wire. Very useful indeed, in a perfect storable form, and easy-to-use later without having to unwind from transformers etc.! The Sony 17-inch Trinitron tube. Destined for the rubbish dump.